We are a small team of very dedicated expatriates and Japanese running a Tokyo-Narita based Campervan Rental Company. We offer our customers a wide range of services at a very competitive rates. Our service does not stop the moment you drive off. We are with you whenever you need us. We provide our customers with 24-hours travel support in both English and Japanese. Our vehicles are equipped with mobile Wi-Fi - enabling you to easily drive and navigate throughout Japan and find free parking locations. We provide free pick up and dropoff from/to Narita station. There are many benefits to rent with Japan Campers! (as long as the vehicle is legally parked). ✔ For your daily needs, there are more than 3,000 hot springs - where you can take a shower and relax in a hot pool. ✔ There are clean toilets with drinking water available everywhere. ✔ Shopping is easy and plentiful. called Road Stations (jap.=michi no eki) where you can park & sleep for free. These stations also sell food and drinks. ✔ There are hundreds of modern Service Parking Areas available on all Japanese highway. with clean toilets) in remote places where you would expect little in the way of services. ✔ There are no dangerous animals. ✔ Coin operated laundries are available in every city. ✔ Hundreds of Camping Grounds stretch the length and breadth of Japan. ✔ There are hundreds of friendly Convenience Stores (open 24 hrs) where you can stock up on food, find clean toilets and sleep overnight. ✔ You will not be alone. Many Japanese enjoy traveling by Campers. Join them and enjoy the companionship of fellow Campers! We have been enjoying Campervanning in Japan for many years. ​There is no reason why you should not do the same! Traveling by camper in Japan is so easy! "See the Sights, not the Tourists" - is our motto. Japan is a country with many hidden treasures that are waiting to be discovered, and is undoubtedly one of the best and safest countries in the world for a Campervan travel. As an independent traveler, you will have the freedom to experience Japan at your own pace. You will be able to visit all the major attractions, but also be able the explore the many less touristy but exquisite locations. Some of them are located just few hours drive from Tokyo. How about visiting Japan and enjoy skiing or snowboarding? Our Campers are fully winterised during the winter season, with winter snow tires and winter Parking Heaters . 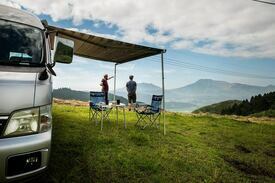 As veteran Campervan travellers ourselves, we have anticipated your every need and fitted our campervans for your safety, convenience and comfort. Our Campers are self-contained, which means you can park & sleep wherever stopping a vehicle is permitted (even in the middle of Tokyo). You will be guided by an English speaking navigation. You can cook your own meals and the on-board WiFi enables you to keep in touch with your friends and family. We trust that you will have a truly unforgettable experience. (98% guaranteed - based on our Customers experience).